Ever since I took a trip to Hanoi, I have been craving for Bun Cha — a Vietnamese dish of succulent grilled pork and noodle. This Hanoi originated dish will leave your taste buds wanting for more and more and more. Bun cha is served with grilled fatty pork (chả) over a plate of white rice noodle (bún). A bunch of herbs is usually provided with a side dish of dipping sauce. Pour some vinegar into the soup. Throw some fresh herbs in. Grab some rice noodles using your chopstick and dip into the soup. Grab the fatty pork along with your noodles. Voila! Your taste buds sing and dance to the rhythm of every slurp. To make your bun cha hunting easier, I have included a link to Google Maps. Click on the name of each restaurant to be brought to its location on Google Maps. Save it as your favourite locations on your Hanoi map so that you won’t miss out on going to any one of these restaurants in the future. This bun cha restaurant is extremely famous because of its delicious mother soup and deep-fried crab spring rolls. 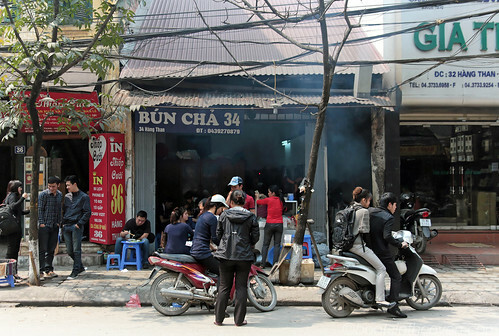 It is by far the best soup I have tasted for a bun cha while bun cha hunting in Hanoi. 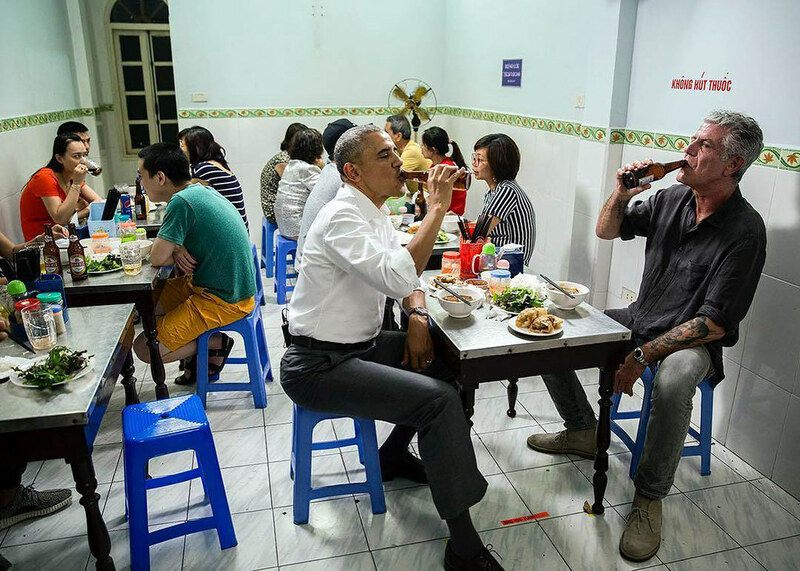 It is so famous that Anthony Bourdain once brought ex-President, Barack Obama here! You might have even heard that they have changed their food menu to include Obama set. The Obama set includes one drink of your choice, a bowl of awesome bun cha, fresh herbs and a big fat piece of crab spring roll. However, there is a long queue to eat here. Be ready to wait for about 10–15 minutes under the sun. Even if it takes longer, I assure you that it is worth the wait! Don’t let this restaurant’s looks deceive you. It may look expensive but I assure you that it is just as affordable to have your bun cha full there. Just like Bun Cha Obama Set, the full set of Bun Cha (which includes grilled pork, 2 traditional spring rolls, and rice noodle) is priced at 90,000 VND. I personally enjoy my bun cha best with Vietnamese Green tea cold which is just 10,000 VND. That is a total of 4.40 USD! “Be careful not to go to the imitation shop which is located next to this original one. The correct address is No. 1 Hang Manh, Hoan Kiem district, Hanoi,” says John, my brilliant receptionist at Hanoi Pho Hotel. Business here has been so good that there are others who are imitating this shop. Its strategic location that is close to most guesthouses, hostels, and hotels is one of its winning points. As for the taste, it may not be as tasty as the others in this list. However, it is suitable for those who would like to eat a less vinegary taste soup base. This is probably the most authentic bun cha you can get. This stall is frequent by locals day in day out. Every time I walked past the restaurant, it is packed. Just by looking at this meal, I am hungry for bun cha again! This place is also sort of a booby trap for tall people. My partner who stands at 6 feet 2″ had some difficulties sitting in those tiny tools. In terms of price, they charge locals’ price even if you are a foreigner. Nem (spring roll) is priced at 8,000 VND each. A bowl of very garlicky bun cha is at 35,000 VND. 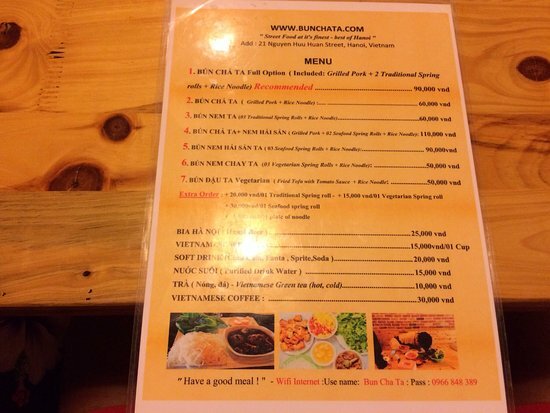 That is a total of 1.89 USD for a bowl of bun cha and one spring roll. This is one place that may or may give a foreigner diarrhea. However, as a glutton, I can’t help but try it out for myself. How crazy it is that this small stall in the alley is standing at 75% 5 stars on TripAdvisor?? I think I don’t have to explain much on how it tastes at its super cheap price of 30,000 VND. All I can say is that this is THE BEST place to eat bun cha if you are not worried about hygiene standards. 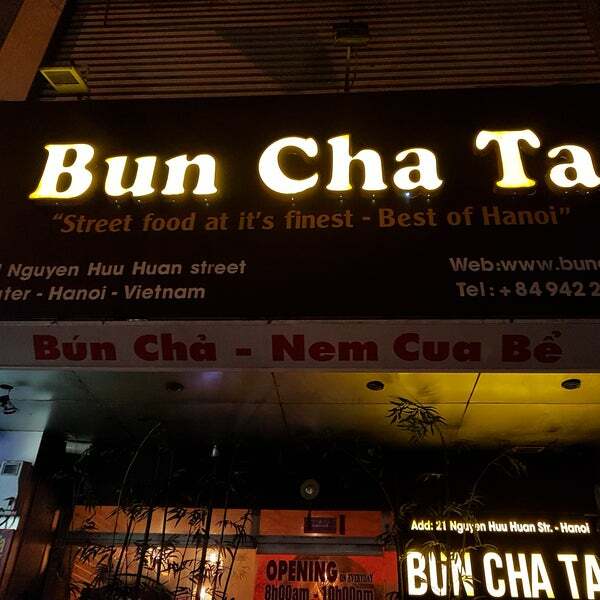 By now, you must be feeling hungry and also wondering why is every restaurant’s name here starts with bun cha. I am on the same page with you except for the later. I meant I did wonder too. I have the perfect answer given by Hanoi Pho Hotel’s receptionist, Jeff, now. “In Vietnam, it is common that the restaurant’s name contains its famous dish so that visitors will know what they serve without asking. It helps visitors find what they want to eat easily, though it might be confusing for some foreigners who do not which is the best restaurant to go to,” Jeff explained. Must-have is almost an underrated term to explain what bun cha is. This is the best dish you will have in Hanoi! It is also my all-time favourite Vietnamese food. Why Are Asians Going Crazy Over This Fruit Which Everyone Hates?